Considering getting a Soft Coated Wheaten Terrier? The Soft Coated Wheaten Terrier is an Irish breed referred as a poor man’s dog. It is a good-natured dog that loves children and gets along with other dogs. It is recommended for first-time owners as long as they are willing to provide all its needs. It is recognised by The Kennel Club under the Terrier group. Are you thinking of getting a Soft Coated Wheaten Terrier? Here is a brief background of this adorable and social Irish dog. The Soft Coated Wheaten Terrier originated in Ireland 200 years ago as a herding, livestock, guard, and vermin hunting dog. It is said to be related with the nobility terriers, the Kerry Blue Terrier and the Irish Terrier, but the Wheaten is referred as a poor man’s dog. Its tail was used docked, which exempted owners from paying taxes. The Wheaten was only recognised as a breed of its own right by the Irish Kennel Club in 1937 and The Kennel Club followed suit in 1943. The breed first arrived in the USA in 1946 and was recognised by the American Kennel Club in 1973. Efforts have been made to improve the gene pool of the Soft Coated Wheaten and the breed is considered a long-lived dog. It is a beloved terrier breed because it is a reliable, gentle and affectionate companion and family dog, often used as a therapy dog. It also competes in agility, obedience and tracking. The Soft Coated Wheaten Terrier is a medium-sized dog that weighs 32 to 44 pounds and 43 to 50 centimetres. This delightful, compact dog has a flat head, well-defined stop with a level top line to the muzzle, a strong jaw with a perfect scissor bite, and a large and black nose. Its medium dark hazel eyes are set under a pronounced brow while its V-shaped ears that fold over are nicely covered with hair. It has a strong, moderately long neck, well-laid back muscular shoulders and a relatively deep chest. 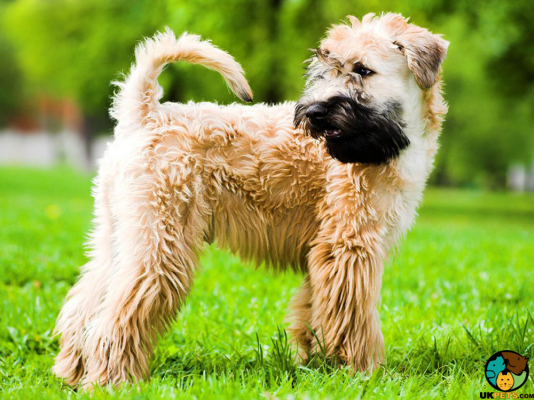 As the name suggests, the Soft Coated Wheaten Terrier boasts of a beautiful soft and silky coat. Moderately long, the coat is loosely waved or curly (large, light and loose curls) that is not woolly or wiry. It has abundant hair on its face that falls forward, covering its eyes as well as in its body and legs. The accepted KC colours are blonde, brown and wheaten. Wheaties have virtually non-shedding hair but have high maintenance dog grooming needs. Daily brushing is needed to remove dirt and avoid tangles. After meals, owners need to wipe the muzzle where food often gets stuck. Some owners prefer to take the breed to the groomer’s a few times a year so home grooming becomes easier. Aside from taking care of the Wheaten’s coat, its teeth must be brushed two or three times a week to avoid bad breath as well as tooth and gum disease. Regularly trim its nails since long nails can be uncomfortable and cause scratches. Lastly, clean its ears to prevent infections caused by too much wax. The Soft Coated Wheaten Terrier is an outgoing, affectionate, even-tempered and confident dog. It loves all its family members but builds the strongest bond with one particular person. Because it craves human interaction, it tends to develop separation anxiety so there should always be someone who stays at home. Children of all ages have a special place in its heart but adults need to supervise all interactions to avoid accidents from being too boisterous during playtime. It usually gets along with other dogs without a hitch but care must be taken when it comes to cats and small animals it does not know. The Wheatie is ideal for first-time owners as long as they are willing to put in the work in terms of early training and socialisation, grooming and exercise. Although this breed is placid, it can have a stubborn streak and would need consistent yet gentle training. The Wheatie is an intelligent dog and a fast learner so training is generally easy. As a sensitive breed, it does not respond to harsh treatment. Positive reinforcements and treats will go a long way during trainings. While it is true that dog breeds have predisposed intelligence and temperaments, each dog is unique. Factors like environment, training and socialisation influence the overall characteristics of adult dogs. A typical serving for an adult Soft Coated Wheaten Terrier is 1.5 to 2 cups of excellent quality dry dog food per day. Remember that size, age, build, activity level, and metabolism should help determine the amount of food and feeding frequency. You also have to consider the individual needs of your pet, which you can discover as it grows. Talk to your trusted veterinarian if you have any concerns regarding your pet’s diet. The number one component of your Soft Coated Wheaten’s diet should be meat from beef, chicken, lamb or fish. Pair it with complex carbs like rice, sweet potato, barley, and oats. For home-cooked food, include supplements to avoid deficiencies, while for commercial food, read the label and stay away from those with too many hard-to-read ingredients. Lymphangiectasia, skin allergies, and different types of cancers. The Wheatie is a high-energy dog that needs at least an hour of exercise in the form of walks and runs, free time at a securely fenced yard, and canine sports such as flyball, agility and obedience. You wouldn’t want this dog to be bored or it can become destructive and noisy. Only a few Soft Coated Wheaten Terriers are registered in the UK each year. This means that those who are interested to own one must be willing to be put on a waitlist. The cost of a well-bred Wheaten is around £300, which can be higher depending on quality of the puppy. Pet insurance for this breed can be around £20 a month. To make the new dog comfortable in your home, you will have to buy basic dog equipment such as a bed, collar and leash, dish and water bowls, toys, and others, which will be around £200. Food costs will set you back £30 per month and veterinary expenses will be around £900 a month. As a rough estimate, prepare to spend £50 to £90 a month, depending on the insurance coverage you choose. 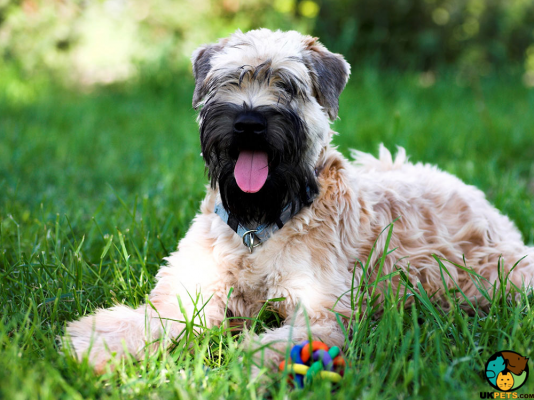 Is a Soft Coated Wheaten Terrier Right for You? The Soft Coated Wheaten Terrier is a placid, loyal and sociable dog. Its beautiful soft coat requires a lot of brushing and will benefit from professional grooming a few times a year. This high-energy dog needs 60 minutes’ worth of exercise. It is suitable for first-time owners and families with kids of all ages. The Wheatie can live up to 15 years.